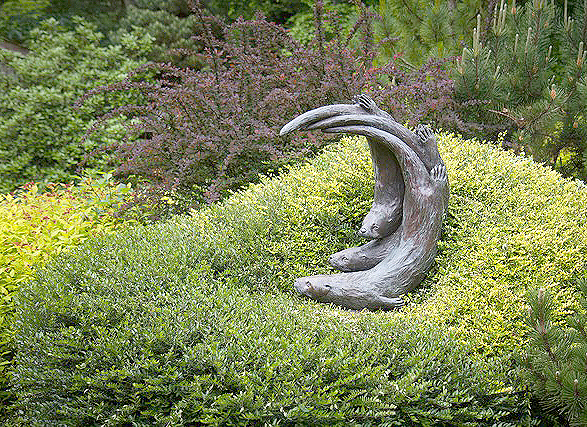 This tour features the work of local sculptor Georgia Gerber. 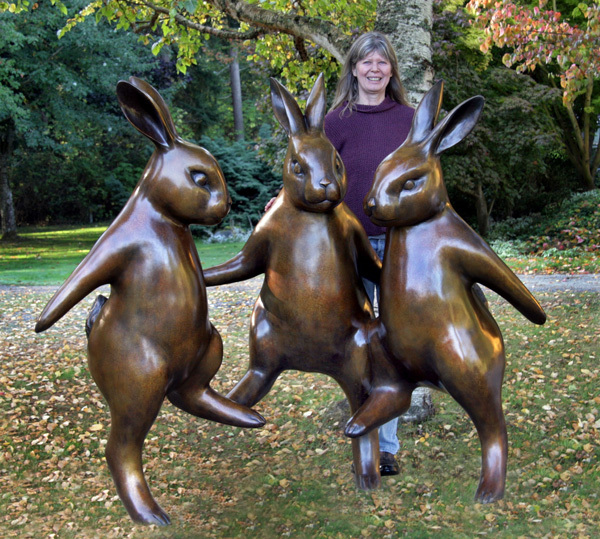 For those of you who may not know, Gerber is a Whidbey Island-based sculptor who creates primarily—although not exclusively—a variety of whimsical and smooth-to-the-touch animal sculptures. Children especially are drawn to her work. My tour begins just after we pick our guests up at Sea-Tac Airport. We make a beeline for Pike’s Place Market where, after we watch the guys throw the fish, we purchase Dungeness crab, sourdough bread and a variety of salad vegetables for dinner. 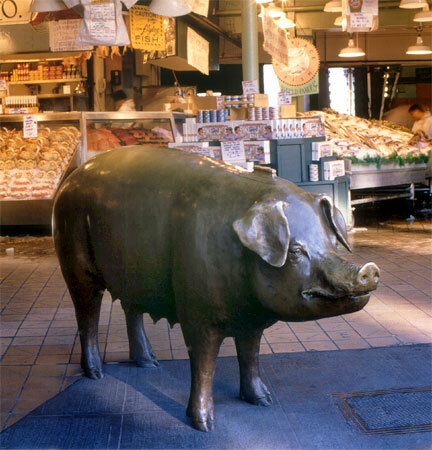 I place the kids astride the Pike Place Pig for a must-have photo. Everyone rubs the pig’s nose for good luck and then we head for home. Riding the ferry for the first time is definitely the highlight of the visit for all newcomers to the Northwest. For a small fee, you are King of the World on the upper deck where the views of mountains, islands and water are simply breathtaking. That night, as we feast on crab, I tell my guests about Georgia Gerber and that the pig we saw at Pike’s Place Market was her work. We talk some about sculpture in general and different types—bronze, stone, clay—and then I tell them we’ll see other pieces she’s done as we move about the Island. The next day, on our way to enjoy a hearty and healthy breakfast at the Braeburn Restaurant in Langley, I drive my guests by the library in Clinton, which is their introduction to the first of many Gerber-created sculptures we’ll see that day. 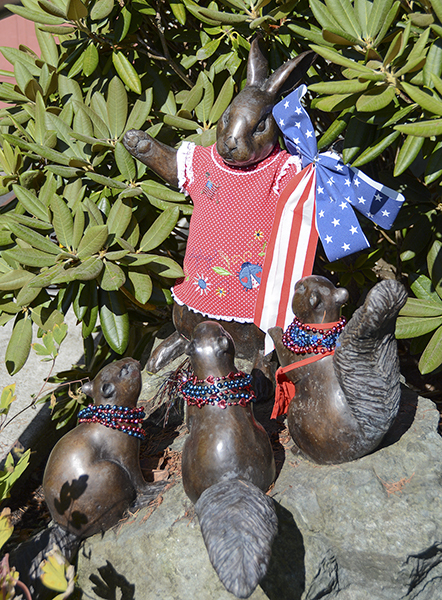 The library staff often dresses the tiny rabbit and squirrels in seasonal garb—a so-Whidbey thing to do. With breakfast done, we pick up our Dancing Rabbits tour at the South Whidbey Historical Museum where we’re greeted by the teenager playing the harmonica, a sculpture meant to remind us of the men who lived in the building while making their living cutting cordwood for the steamboats of the Mosquito Fleet. We leave a coin in his bucket. We continue down the street to the Brackenwood Gallery. 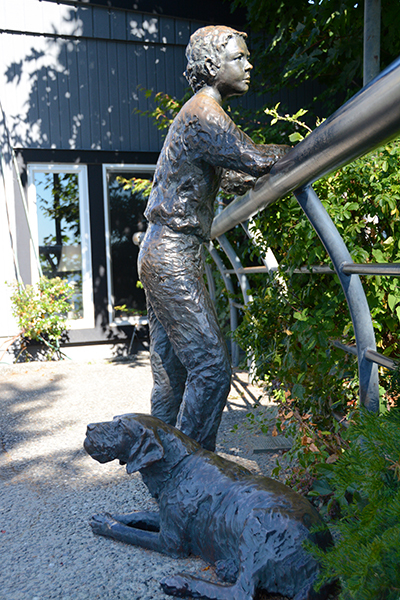 Outside is a sweet little bronze dog—a replica of Reggie, the beloved pet of Ron Childers and Richard Proctors, original owners of the gallery space 27 years ago. Reggie was known as the gallery greeter. 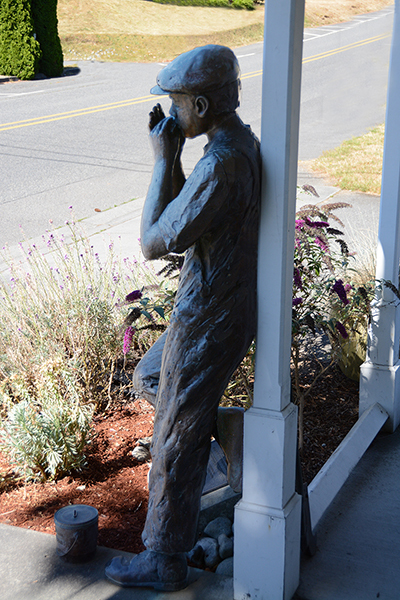 Gerber sculpted the replica as a tribute to Ron and Richard’s dedication to the arts in Langley. The children (and some adults) pet Reggie before we go inside to see more of Georgia’s work. 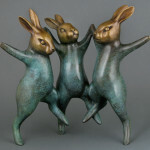 Her dancing rabbits are everyone’s favorite. Next, we walk to the world-famous Inn at Langley and—by now—all are in tune with what a Georgia Gerber looks like. I tell the children if they can find another Georgia Gerber, I’ll take them to Sweet Mona’s for chocolate or gelato. It doesn’t take long for them to spot the penguins and the duck. Sweet Mona’s—here we come. Following our chocolate break, we head down Second Street where, just past the Langley Library, we all spot Gerber’s otters nestled in a secret garden. Then, as we round the corner onto First St., it’s time for what I call the “Gerber coup de gras”— a photo of everyone standing beside Gerber’s iconic sculpture, The Boy and The Dog. Not counting the Pig at Pike’s Place Market, the Boy and the Dog may be the most-photographed Gerber sculpture in the world. 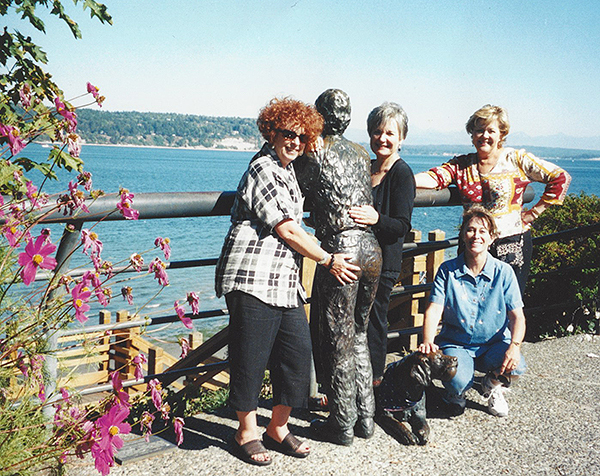 Before my guests leave, we print out all our Georgia Gerber sculpture photos and place them in a WHIDBEY-cut photo mat. They always put their dancing rabbits in the middle. Donna buys her “WHIDBEY” photo mats at Windjammer Gallery on First Street in Coupeville. Editors note: Do you know where other public sculptures by Georgia Gerber are located? Tell us which ones Donna can add to her tour! 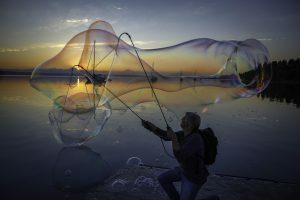 Donna Hood, a feature writer and Texas transplant, never ceases to be amazed at the creativity of the many talented artists on Whidbey Island. Thanks, Donna. We have lots of visitors coming and this is a great idea. I absolutely loved this story for its content and great writing. Donna, great job of showcasing Georgia Gerber’s work with your wonderful commentary. I truly enjoyed the photos and commentary. It is always good to be reminded of the beautiful places you so often take for granted. This is a great idea of sculpture tours. We have many pieces in Langley that have been inventoried by Michelle LaRue at Big Sister that lend themselves to a Langley sculpture walking tour. It would be fun to have them geocoded for following and maybe recorded information on an I-Phone or Android Phone and then we could put them on the Chamber of Commerce or City website. Thanks for this article. Monday through Wednesday (except in August) you can stop by Healing Circkes Langley. We have work from local artists, including Georgia, throughout the building! Thank you for the article Donna – Clever way to tour the community.